Welcome to Sweet Carolina Labradoodles! We are excited to have you visit our page! Sweet Carolina Labradoodles was born after the loss of my seventeen-year-old darling Yorkie, Rusty. Rusty was my dog long before my husband and boys came along. In typical terrier fashion, he was the alpha male of the home and did not particularly enjoy the competition of a husband and children! While I adored Rusty, I knew when he left me, our next furry family member needed to meet as many of these qualifications as possible. Was I being picky or what? Since the Australian Labradoodle dogs are bred in three different sizes (mini, medium, and standard) the perfect size for us was the mini, which does not typically weigh over 23 pounds. 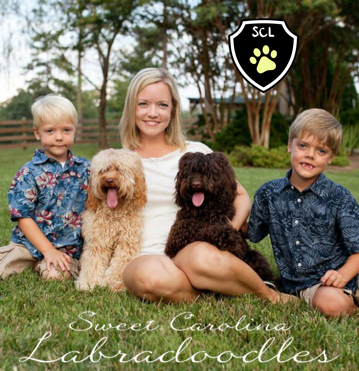 In fact, we fell so in love with this breed we wanted to begin Sweet Carolina Labradoodles as a family business. God has opened every door of this adventure for us in such a perfect fashion that we know He is blessing us and has in turn blessed others with these wonderful pets. We give Him the credit for our good fortunes! Our goal at Sweet Carolina Labradoodles is to breed the highest quality Australian Labradoodle as well as provide our clients with a pleasant adoption experience while placing our puppies in their forever homes. Our breeding stock is chosen based upon many elements such has high quality pedigree, health, temperament, and body structure. Share our main living areas just as they will in their new homes. Begin to learn basic training commands. Receive vaccinations due up to 8 weeks. Have a two (2) year health guarantee. Each adopting family will be required to sign a contract promising to have their puppy spayed or neutered at the appropriate time. This is to ensure the integrity of the breed as well as maintain an ethical and responsible breeding policy. The medical records from the doctor’s office with the puppy’s micro-chip ID number included on the document should be mailed back to Sweet Carolina Labradoodles to fulfill the contract. To learn more about why the Australian Labradoodle breed is so special – please visit Our Labradoodles page .